BOOK ONE IN A BRAND NEW SERIES by Nebula and Hugo Award Winner Catherine Asaro set in the world of her Skolian Empire universe. In the galaxy-spanning future, Major Bhaajan is a tough female P.I. who works the dangerous streets of Undercity. Major Bhaajan, a former military officer with Imperial Space Command, is now a hard-bitten P.I. with a load of baggage to deal with, and clients with woes sometimes personal, sometimes galaxy-shattering, and sometimes both. Bhaajan must sift through the shadows of dark and dangerous Undercity--the enormous capital of a vast star empire--to find answers. 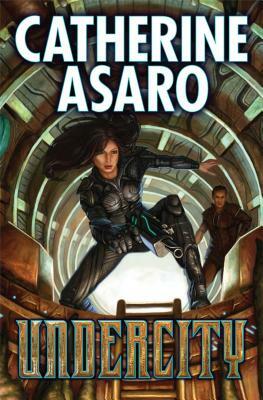 Two-time Nebula-award winner Catherine Asaro has an M.A. in physics and a Ph.D. in chemical physics from Harvard. A former ballet and jazz dancer, she founded the Mainly Jazz Dance program at Harvard and now teaches at the Caryl Maxwell Classical Ballet. She has recently taken up singing, doing several gigs with contemporary and jazz styles. She's the creator of the popular Skolian Saga science fiction series with The Ruby Dice, Diamond Star and Carnelians, published by Baen. Her other books include near-future technothrillers Alpha and Sunrise Alley. Asaro lives in Maryland with her husband and daughter.